This function allows users to edit the Draft Internal Stock Transfer. For serialized items, users need to select the serial numbers from here before converting the Draft to an actual Internal Stock Transfer. Enter the Stock Transfer PKID, click 'Submit'. The information on the Edit Draft Stock Transfer page is the same as the Create Draft Stock Transfer. Users can refer to the Create Draft Stock Transfer for the details. If users edit the Branch and Other Details information. Click 'Set Details' to save the changes. Users can 'Edit' or 'Delete' the items that are added on the Draft Stock Transfer under Actions field. 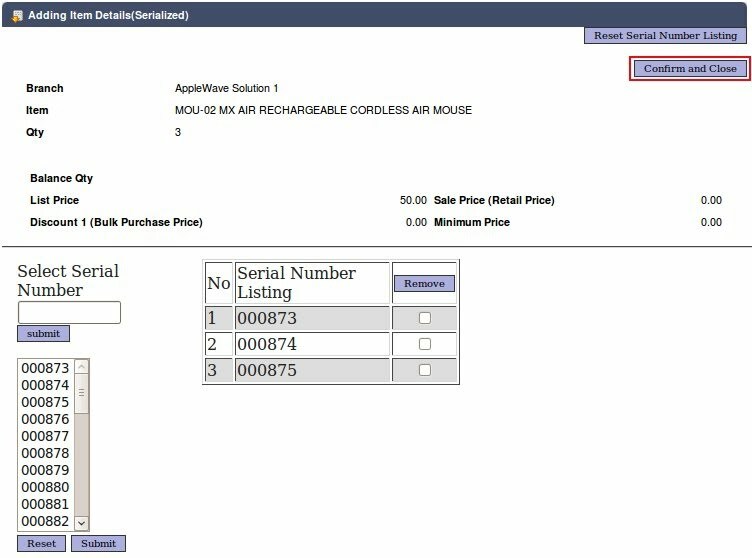 If the item is a serialized item, users need to click on 'Edit' to select the serial number. Select the serial numbers, then click 'Confirm and Close'. The serial numbers selected will appear in the table under the Item Name. After done editing the Draft, click 'Confirm and Save'. Click 'Convert to Stock Transfer' to convert the Draft into actual Stock Transfer. A pop up box will appear asking "Are You Sure convert to Stock Transfer?!!". Click 'OK'. The Draft will be converted to an actual Internal Stock Transfer.